The service “Word Frequency Counter” solves the problem of obtaining statistics on the use of arbitrary character sequences in a text. A particular case of this problem is counting the frequency of words in a text. To obtain the necessary statistics, one can input any text and choose two sets of characters to customize the operation settings of the service for a particular task. The first set includes the characters that can compose a word. Here a user can place an alphabet or a set of characters that will be used for recognizing words in the text. The second set includes the characters that can compose a word, but can not be in the beginning. Main and partial stresses, apostrophe and hyphen are placed here by default. 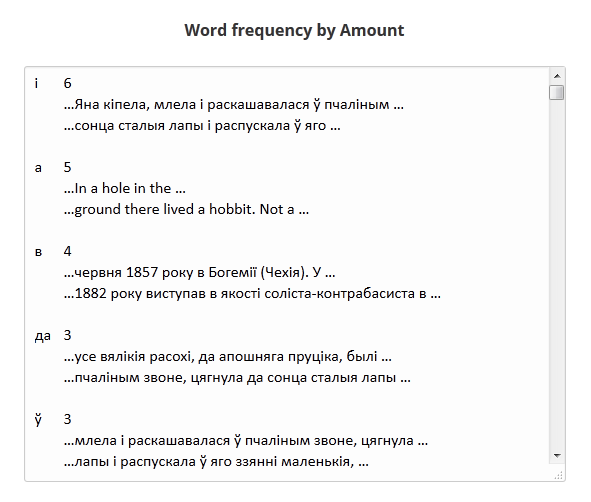 After clicking on “Get frequency of Words!”, a user gets a list of words (or character sequences) with the frequency indicators. The list is presented in three forms: ordered by frequency of words, ordered alphabetically and sorted reverse. If we unmark case-sensitive analysis, we will get different results, as same words in different letter cases will be counted as one. The analysis of the same text gives us the following results sorted in alphabetic order.